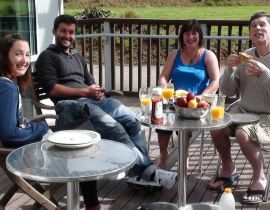 At Slope Point Accommodation we have 2 self-contained units. This is based at our main site where our home and farm buildings are. The advantage is clear at lambing time where you can feed the orphan lambs and at shearing time you can view and even take part if you want. Cost: $90 per room per night. Although you do have your own cooking area, you still have access to the main kitchen and common room area. 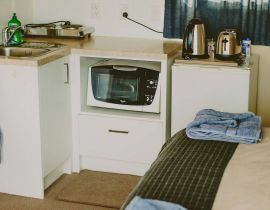 Currently the room has 2 hot plates and a whirlpool microwave oven that cooks and grills etc. The main kitchen does have a full sized oven if required. Towels are provided. This rooms is similar to a motel style room. 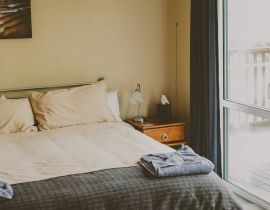 With the indoor - out door flow of the balcony, this is the perfect way to end your day exploring the Catlin’s coastline. Please note that this room currently has no TV. There are numerous magazines and games to get from the lounge. We do provide a CD/MP3 player for your use if desired. 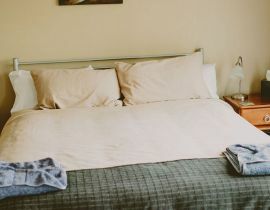 We have wanted to keep this room affordable for guests to enjoy so we have decided to keep the price as low as we can. Wifi available. 50MB free each then pay as you go.